Today Petey and I started our Red Rock Country scenic drive toward Sedona. We simply drove one mile south to Call of the Canyon Day Use Area and took a five mile hike on West Fork Trail. Less than a quarter mile into Oak Creek Canyon are the ruins of the Mayhew Lodge constructed in the late 1800’s. The oldest structure was built by “Bear” Howard, who earned his nickname by killing four bears armed with only a knife. The lodge, nestled beneath the canyon walls and next to an apple orchard, operated until 1968. It hosted stars such as Jimmy Stewart, Clark Gable, and Walt Disney. Western author, Zane Grey, wrote of this area in Call of the Canyon and in 1942 a movie version was filmed in the area. The US Forest Service purchased the cabins and placed the site on the National Register of Historic Places until a fire gutted the buildings in 1980. As we followed along the trail, we met a variety of people. The first couple we met, Renatta and Alan, were electrical engineers that retired to the area from San Diego about seven years ago. We hiked with them for a while since they knew the many twists and turns of the path. I think we crossed the creek twenty-two times on our round-trip journey. At first I made an effort to balance on the fallen trees and leap from rock to rock to keep my feet dry, but after about the sixth crossing, I waded through the ankle deep water. It was funny to watch Petey follow in my footsteps. Frankly, I’m perplexed that he hasn’t figured this out, as he is a wizard at escaping from the back yard and at opening containers. Shoot, Scout used to forge across the creek, but Petey always followed me. Maybe he doesn’t like his feet wet! Anyway, we continued on as Renatta pointed out different rock formations, a cave, and a variety of wild flowers until we finally came to a rest at a rock overhang. After a short rest, we split from Renatta and Alan and retraced our steps back to the trailhead. We met a few more people along the way, including Jenny and Mary Anne, moms that were vacationing together in the area. They were from Southern California and offered me a helping hand when I arrive in their home state! After a lovely morning at Call of the Canyon, we drove a little farther south to Sedona. What a phenomenal setting! I was just in awe. I have wanted to come here since my Aunt Risa raved about it years ago. 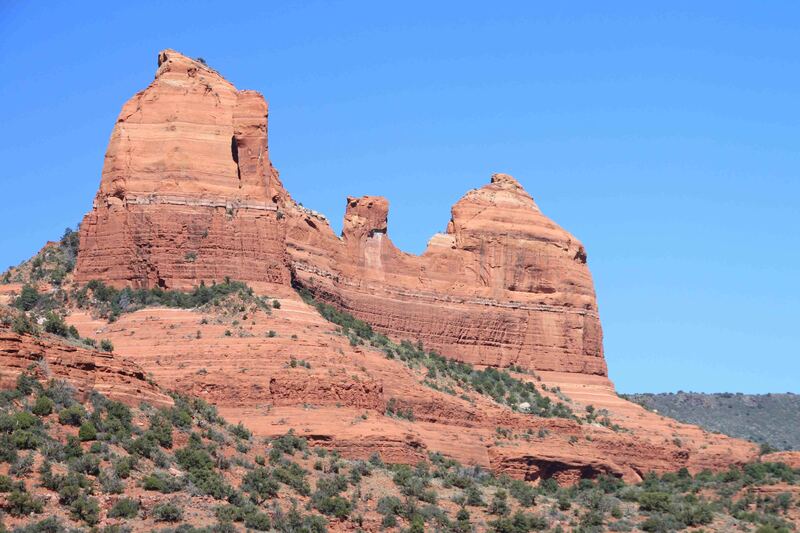 Sedona’s scenery met or exceeded my expectations, which is very tough to do when they are set high. The tourist town with lots of crowds and overpriced, mediocre mexican food is flanked by mesas, buttes, and spires. Each has a name: Steamboat Rock, Sphinx Rock, The Guardians, Chimney Rock, Cathedral etc. I spent at least an hour just driving to high points around the area to enjoy the tremendous landscape. Pinks, reds, whites and oranges glowed in the scorching sun. I can’t imagine watching the sunrise or the sunset here: it must be remarkable.